This mass of rubble may just look sad but really, this represents good progress. You are looking at the most significant architectural change to the house. 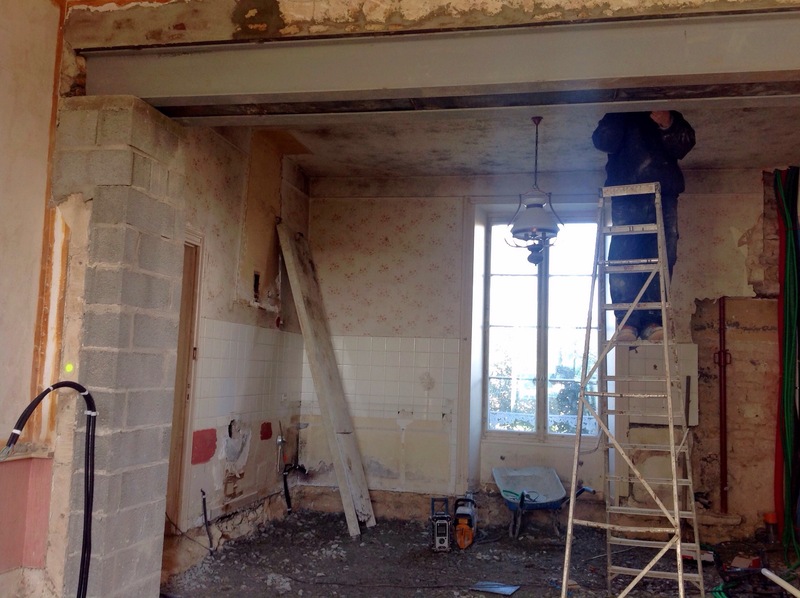 The contractor has removed the wall between the kitchen and dining room. Please note the bravura performance. They removed a rubble wall that was maybe 12 feet high, even more across, and about two feet thick. They inserted two steel beams, getting them dead level. They installed concrete block walls to support the beams. This was all done while working on an uneven, unstable surface and without damage to the existing, fragile, directly adjacent cornice. One day the National Trust will find out about these people and we’ll lose them to much more prestigious jobs. Today, fortunately, they are at my house. We are now ready to reverse the kitchen and dining room. The man you see in the photo is part of the crew that is doing the rough wiring and plumbing. At this point we have light from two sides of the room, which is already lovely. In the next little while the frames will arrive for the window and door that will be added on the wall to the left. Given the amount of light that has already been added, more light is hardly necessary. However it will be nice to connect the kitchen to the terrace, which will be just the other side of the wall.I don’t know about you but if I don’t see a space, or if it is hard to get to, I don’t use it. I take a vicarious pleasure in looking at other folk’s chaos , dust and squalor for a change, when my own building site has temporarily lost it’s charm……………..
Dust, squalor and, now that the cold and rain are here, more than a little mud. Come to think of it, it’s Saturday. The workers are gone. Time to go survey the ruin. Next Post This is not a tidy job site.